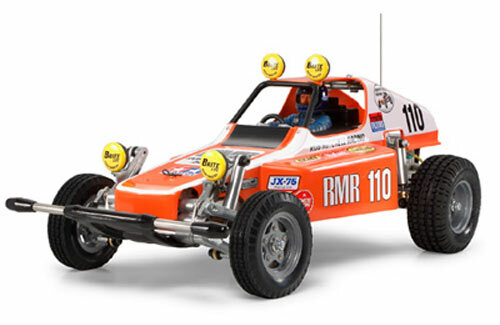 All Products > "58441 Tamiya 1/10 Rough Rider SRB Kit"
This is a 1/10 R/C assembly kit, measuring 400mm in length when totally assembled; it features a full set of ball bearings, an ESC and type 540 motor included. Comes loaded with many top quality parts for improved performance such as a duralumin plate reinforced 2mm thick FRP main frame, die-cast front and rear suspension arms, front axle; even the wheel hubs have been newly designed for this re-release. Additional features include a clear transparent waterproof case that protects the R/C mechanisms, reinforced front uprights soaking up the bumps courtesy of the re-designed oil dampers. Comes in the same original blister pack style packaging as the 1979 original, and features the same injection moulded hard plastic body as the original; easily painted with Tamiya's range of TS spraypaint or indeed any car paint. Can be used with separately available LF1100-6.6V Racing Pack (Item 55105) which is specifically made for this machine. Add it to your basket now and re-live the golden age of RC action!